Soffit. n. A portion of the ceiling that is built lower than the ceiling area adjacent - often appearing a bit boxy. 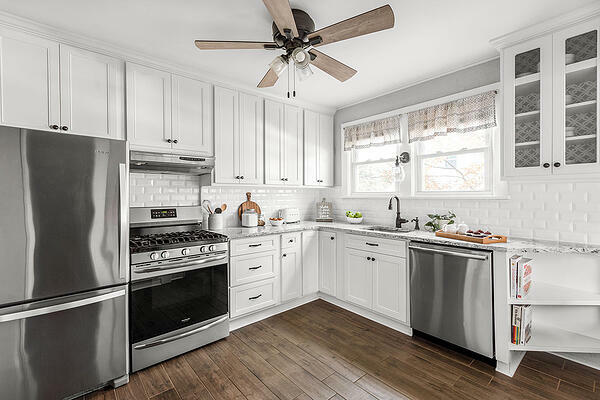 Used most often to hide plumbing, electrical or HVAC ductwork, in kitchens, they often appear in the space between the ceiling and the top of cabinetry. Eliminate the soffit, and you may gain significant visible and usable kitchen space. Most homeowners become so used to soffits, they don't think twice about them - or didn't even know what they were in the first place. However, the space they take up - often unnecessarily - can make a tremendous difference in both the looks and the function of your kitchen. 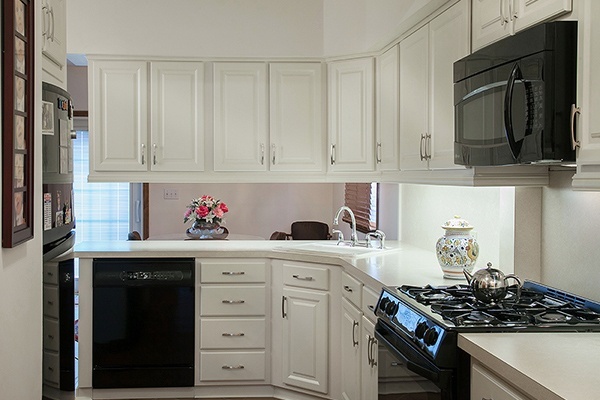 On the flip side, eliminating soffits may result in cabinets that appear "too much," too bulky, or are simply so inaccessible you never use the upper-cabinet space anyway. 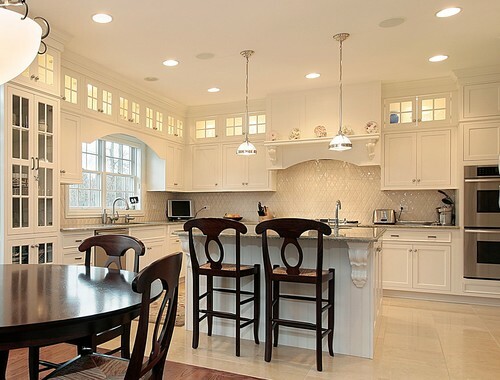 Which Soffit Option Best Accommodates Your Kitchen Design? Here are questions to work through with your kitchen design and build team as you determine whether or not to eliminate or re-design soffit space. What's behind the soffit and/or is the soffit necessary? Soffits hide the internal workings of your home - and in homes without attics, basements or large crawl spaces - they become part of the home's visible interior. Sometimes soffits are necessary, sometimes they're an easy fix for something that could have been hidden. Only a contractor knows the difference. So, the first question to ask is—what's behind the soffit? And, is the soffit essential? In many cases, contractors can re-work what's behind the soffit into the internal wall structure—although this will add to the design budget. Other times, they might have to stay. 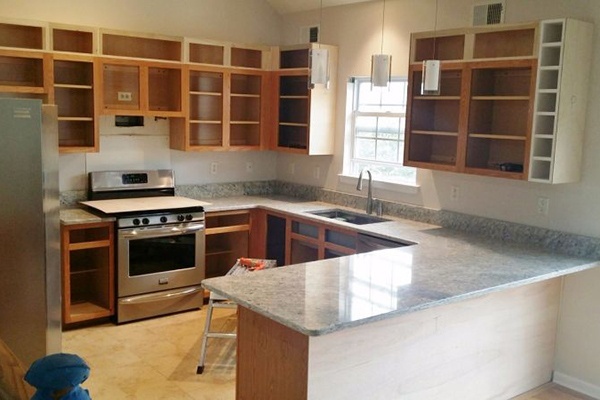 Would the kitchen look better without the soffit? Even if you don't want to take the cabinets up to the ceiling (see next question), your kitchen design may look more clean and spacious without bulky soffits. Even a 7-inch gap (assuming upper-cabinets are 32-inches tall) gives you extra room for storage on a top cabinet shelf (accessible via step stool), while leaving a visual space above. You can play with the amount of space between cabinet and ceiling as you work with your designer/builder. 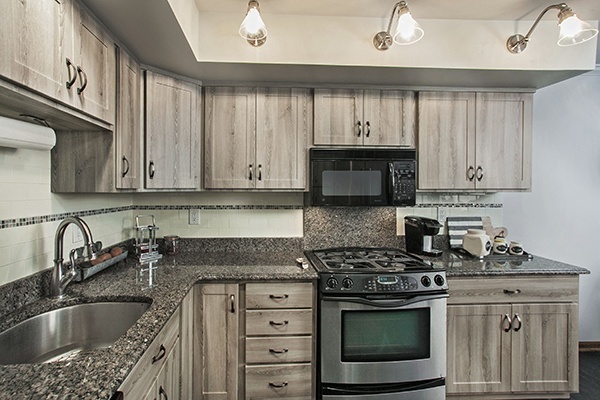 Removing some or all of the soffits also provides flexibility in how cabinets are installed, allowing for a staggered look that's popular right now. Do we like the cabinet-to-ceiling look? Another option is to remove the soffit and take cabinets to the ceiling. For some, this is simply too much cabinet. However, there are benefits to this approach. Smaller and/or shorter kitchens gain the illusion of being bigger and taller, with the added benefit of more storage space. 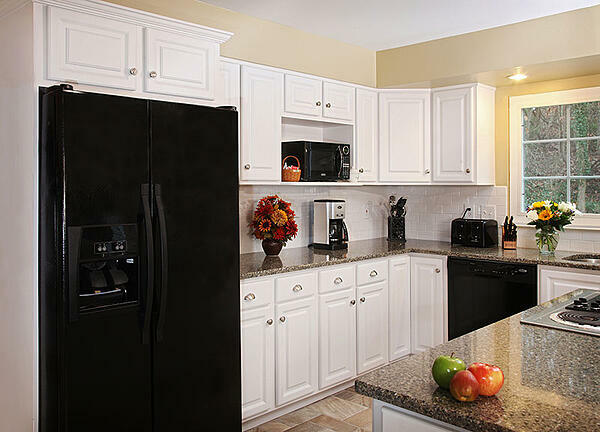 There is also a very streamlined, seamless look when cabinets run all the way up to the ceiling. Getting seasonal and lesser-used serving/dishware up into those higher reaches means you might be able to give up a lower cabinet box elsewhere and put that storage space to better use. 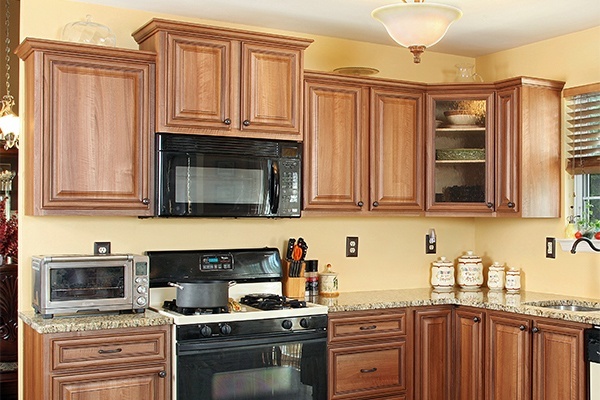 Design tip: Want to get rid of cabinets but don't want to take cabinets up to the ceiling (or leave a dusty shelf space)? Add an "extra" shelf of cabinets and install glass doors with interior lighting - a beautiful, ambient approach that adds space and light. Are soffits advantageous to the overall design? Then there are times when soffits benefit the design. This is the case if you want to use that space to mount specific lighting fixtures, if you have art to display, or if you need additional cabinet support to hang cabinets that create a separation between your kitchen and an adjacent living space. 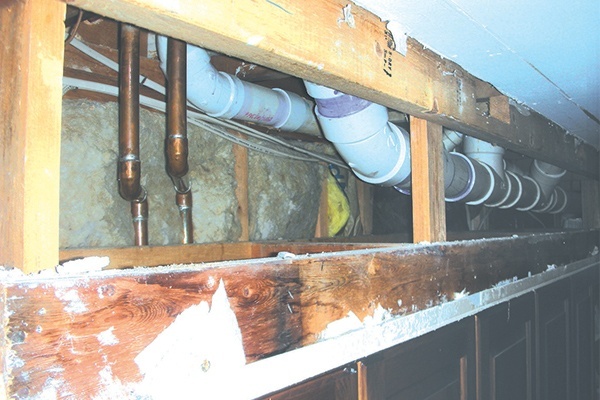 Are you torn between eliminating or keeping your soffits? 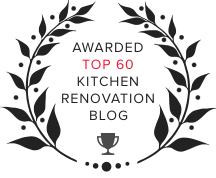 Visit Kitchen Magic to discuss your ideas and others with experienced designers and builders. 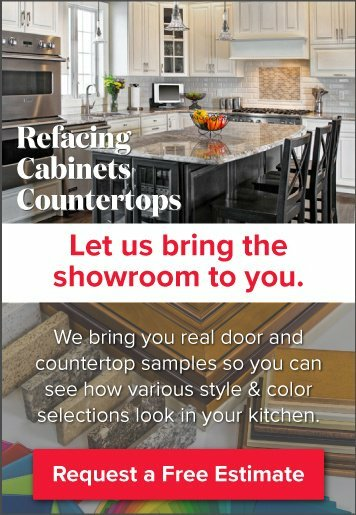 We have both the contracting know-how, and the design expertise, to ensure you make the best overall decision for your upcoming kitchen remodel.